The truth is that protecting your assets from nursing home spending in getting harder and harder. and ethical ways to get such care while still passing on assets to your heirs. And, the ways which do work require more advanced planning whenever possible. Elder Law reports and tell us which reports you'd like to receive. Are you concerned about the increasing cost of nursing home care? 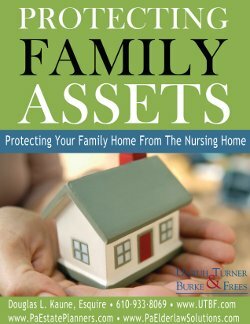 Are you afraid that if you or a loved one needs long term nursing care the family home will be lost? In this report we will tell you how you can protect the primary residence so that it can be safely passed to the next generation. There are a number of options available for those entering into advance planning. There are also little know exceptions to the laws governing gifting and Medicaid qualification that may save the home even when nursing home care is iminent. 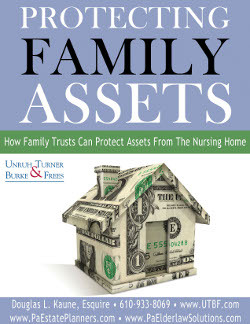 This report is a must read for those who are interested in sheltering the family homestead from nursing home spending regardless of where you stand in the long term care process. 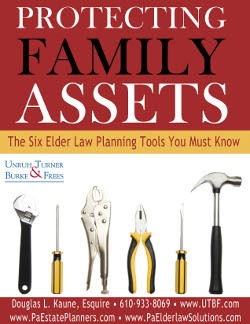 CAll 610-933-8069 or email me at [email protected] and mention elder law to recevie this free report. 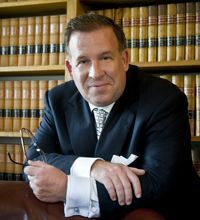 Would you like to learn about Six (6) different methods to legally protect $10,000 or more from spending on nursing home care? It does not matter if you think nursing home care will be necessary for you or a loved one tomorrow or five (5) years from now, you need this report now. The sooner you start planning, the greater the array of options available and thus the greater the portion of the estate that can be preserved. It is never too late to use some of the techniques described in this report, but planning early could mean additional savings of hundreds of thousands of dollars! This report details how the Irrevocable Medicaid Asset Protection Trust is used to protect assets from spending on nursing home care. Gifts to these irrevocable trusts are far superior to those made outright to children or family members. Among other benefits, you can choose to retain income payments from the trust, protect the assets from bad spending habits of your children and loved ones and protect the gifted assets from divorce or creditors of you beneficiaries. These are just a few of the potential benefits of using this Irrevocable Trust. Get this Report and learn more now. Posted on 09/01/2012Are You Obligated To Pay A Parent or Grandparent's Nursing Home Bill?